In desperation, Edward Elric sacrificed his body and soul to rescue his brother Alphonse, and is now displaced in the heart of Munich, Germany. He struggles to adapt to a world completely foreign to him in the wake of the economic crisis that followed the end of World War I. Isolated and unable to return home with his alchemy skills, Edward continues to research other methods of escaping the prison alongside colleagues who bear striking resemblances to many of the people he left behind. As dissent brews among the German citizenry, its neighbors also feel the unrest of the humiliated nation. Meanwhile, Alphonse continues to investigate Edward's disappearance, delving into the science of alchemy in the hopes of finally reuniting with his older brother. 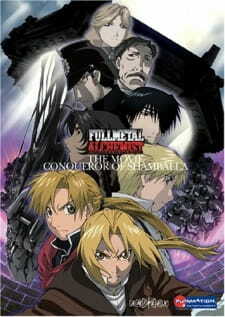 Fullmetal Alchemist: The Conqueror of Shamballa won the Best Animation Film Award in the 2005 Mainichi Film Awards, the Animation of the Year and Best Original Story awards in the 5th Tokyo International Anime Fair, and the Best Animated Film prize in the 2006 Fantasia International Film Festival. Want a real conclusion to the events that happened in Fullmetal Alchemist? Then you should watch Fullmetal Alchemist: The Movie &ndash; Conqueror of Shamballa. In my opinion, it is impossible to get some real closure from watching the series alone. If you watched the series and followed it religiously like I did, you probably also marveled at how close Ed and Al are that they are willing to risk their lives for each other. If that&rsquo;s the case, then you were also probably shocked that the series ended with the two brothers separated, Ed on Earth, specifically in Germany in the year 1923, and Al stuck in Amestris, specifically in Resembool. In the movie, Earth and Resembool are treated as parallel to each other, and you see how they interact with each other while in the process, the two brothers try to reunite themselves. It&rsquo;s definitely a wonderful storyline that will give viewers the conclusion they&rsquo;re looking for. I guess to keep things fresh and exciting, the characters were given new looks to go with new storylines. Ed and Al certainly have matured (and they look cool! ), and the same goes for minor characters such as Winry and Roy Mustang. I don&rsquo;t want to spoil anything, but here&rsquo;s a hint &ndash; dead characters are even brought to life in the movie, however they have different personalities. All the characters still have their respective voice actors from the series, but there are also new additions to the cast such as a gypsy girl named Noa (Miyu Sawai), who I don&rsquo;t really like because she whines too much, and a new villain, Dietlinde Eckhart (Kazuko Kato). Even the visuals of the movie were new and improved. The character design became sleeker, the backgrounds are more detailed and attractive, and the color coordination is better than in the series. I especially like how the colors in Earth have a slightly weathered look, while the colors in Amestris are bright and vibrant. Michiru Oshima, who worked on the music of the series has returned to compose music for the movie as well, but I have to say I like the music of the series better. The music in the series was more striking and memorable compared to the music of the movie. L&rsquo;Arc~en~ciel also sang the opening and ending themes of the movie, and just like the series, they also came up with catchy tracks for this one too. As much as I liked the movie, I have to say that I like the series more. It&rsquo;s not because of the plot per se, but I was disappointed that there was less talk of alchemy in the movie. Alchemy was so important in the series that it made the plot, but that wasn&rsquo;t the case for the movie. Moreover, Al and Winry, two of my favorite characters, didn&rsquo;t get enough screen time, so that disappointed me a bit. However, I still recommend in watching the movie, because like I said earlier, Fullmetal Alchemist: The Movie &ndash; Conqueror of Shamballa will provide closure for the series. I&rsquo;m going to have to diverge my opinion from the consensus here. Though I had been a long time fan of the series, the movie was a dull, disconnected effort to recapture the quality of the former. This is where things fall apart. The general premise of the story was high quality yet the execution in relation to its source material was poor, largely because the end of the series left so many plot threads to be explained. Unfortunately, the movie spends less time attempting to address these numerous plot threads and more time creating larger questions of its own. This is fine by itself but Shambhala is inherently a continuation of the series rather than a stand-alone piece. It begins with an unanswered series of questions, brings forth a new series of questions, and in the end, doesn&rsquo;t conclude in answering any of them. Beautiful and fluid as always: even more so since this is a feature length film. Far above average. The film is lacking in truly memorable pieces in the vain of its predecessor series (Brothers, Heavenly Spirit) but it manages to capture the viewer into the world it creates. It melds well into the background and there&rsquo;s little to be said otherwise. A notable exception is the movie opening, Link, which easily ranks among the best of the franchise. And this is where the story comments arrive into effect. The returning characters are handled well; the newcomers on the other hand fall victim to the films limited length. So much time is spent on the original characters that Noah and Dietlinde appear as cardboard cutouts. The villain becomes prominent towards the second half, acts in the stereotypically evil manner, espouses a tacked on, clich&eacute;d motivation for its actions, and proceeds to be literally dehumanized thereafter. Other new characters are treated in a similar manner with two sentence reasons for what motivates them. Interesting enough. If you take it as a continuation of the series, it often fails to reach a conclusion for plot threads espoused within it, while if you view it as a stand-alone work it still has some glaring problems in the character department. Still, its imaginations should manage to capture any viewer&rsquo;s attention and many of its other qualities are top notch. The overall presentation was gorgeous but the story and character flaws were often to glaring to ignore. An above average score but not that of a masterpiece. This is a brilliantly written film that works in the tension of post WWI Germany to the plot exceedingly well. The people who wrote this film know their history and their folk lore, using aspects of the Nazi society (including Hitler&amp;rsquo;s supposed obsession with the occult) to pen an enthralling experience. I went and looked up a number of the references made in the film to find out most of them were real. The setting also leads to lots of character conflict. For instance, Hughs (the Maeyz of our world) is a soldier in Post WWI Germany suckered into joining the Nazi party out of desperation. He genuinely thinks the Nazis are doing the right thing (remember, none of these characters have the luxury of knowing where all this will lead) which puts him at odds with Ed. It&amp;rsquo;s very moving. The characters from the TV series are all there. Ed takes center stage, with the majority of the film taking place in our world. Al and his alternate version feature prominently, though. Al&amp;rsquo;s bit in the underground city with Wrath and Gluttony is amazing. Some of the other characters, like Winry and Hawkeye, are somewhat cheated of screentime, but practically every character from the show gets to make an appearance, even if it&amp;rsquo;s just their alternate version (there&amp;rsquo;s one cameo at the very end of the movie that&amp;rsquo;s absolutely hilarious). The animation in this movie is non-stop eye candy. The fight scenes and action sequences are all fluid and choreographed to perfection, but that&amp;rsquo;s only the half of it. The backgrounds and environments are lush and detailed and are just dripping with beauty, even when the setting is the dank bowels of a castle. I&amp;rsquo;m so thankful I got to see this film on the big screen. It&amp;rsquo;s hard to rank Conqueror of Shambala. If you&amp;rsquo;ve seen the TV series you will adore this film. If you haven&amp;rsquo;t seen the show, you&amp;rsquo;ll like all the pretty animation, but the story will go completely over your head. Still, if viewed in the proper context, this film is worthy of a 9 to 10 rating. And if you haven&amp;rsquo;t seen the TV series, do yourself a favor and go check it out. You&amp;rsquo;ll be glad you did. Full Metal Alchemist is one of the best things to come out of Japan in a long time. Thank you for reading my review of this movie if you have any questions please join my friends list and i can help you best I can. With The Conqueror of Shamballa, I feel as though the anime creators were able to have some relief from their struggle with the source material of the Fullmetal Alchemist series. Partly because they made the anime before Hiromu Arakawa finished the manga, there was always that tension to keep true to the basic outlines of the plot and characterizations of the manga as much as possible while still pursuing their own altered version of the story. But when Edward Elric clapped his hands together and transmuted himself into our own world at the closing of the series, they finally left the confines of Hiromu Arakawa’s plans for her story and transmuted her characters and inventions into their own territory. With their relief came my own as a viewer. Gone were their efforts to intensify their story to make it as plausible as Arakawa’s, which at times resulted in heavy-handed melodrama. Now, with the fully established foundation of the series, they were able to create a meaningful but adventurous and inventive movie. For while none of it is a direct adaptation of any part of the manga, the complexity of the plot, the overarching messages, and the feeling of adventure made it seem much more true to the manga than the series was. Edward is perfectly portrayed as a stronger and more mature person reminiscent of his character in the end of the manga. The regret that incessantly dogged his steps and formed shadows under his eyes in the anime series is all but nonexistent now as with the wisdom that can only come with age, Edward seems to have accepted that avoiding the responsibility and results of his actions with quick fixes is not always possible. Alphonse’s character has regressed slightly for the loss of his memories and the drop in his age. For once, he actually seems like the younger of the two in idealistic naiveté as he is determined to find his brother at any cost. The movie shines most of all in its portrayal of the brothers’ relationship. Building on the countless trials and triumphs the two have shared throughout the fifty-one episodes of the original series, their separation and reunion is more stirring than a mere two-hour movie could have accomplished on its own. They are separated now not only by distance of time and space but of circumstances and experiences, but their bond is as affecting as ever if not more so. This is aided by the consistent visibility of Alphonse’s face, which is primarily hidden in every other entry in the Fullmetal Alchemist franchise. Also among the returning cast from the series is a defeated depiction of a Colonel Mustang who no longer practices alchemy. This new development seems both inconsistent with the original series and a travesty of his manga counterpart. In fact, aside from the brothers, this movie failed to properly utilize and accurately portray almost every returning character to the series. The slight exception is Winry, whose subplot is given just enough weight to make up for the way in which the original series seemed to forget about her near its conclusion. Her part in this movie supports the heart wrenching realism that floods its climax. The new additions to the cast, that is, the characters of the parallel world, while far from exciting, carry their own burdens and troubles that do not depend on the Elrics. They are all much more ordinary than the characters from Edward’s world, much as their own world is more ordinary than that of Amestris. Edward tries and fails to remain detached from them and their world as their actions affect and influence him. It’s as though these characters fight for their place in the story of Fullmetal Alchemist, much as they at times strive to be recognized as real people in Edward’s eyes when he neglects them as some inconsequential dream. Facing the truth is the main focus of The Conqueror of Shamballa. From Alphonse’s single-mindedness and Edward’s struggle to recognize the significance of a parallel world, to Mustang’s rejection of responsibility and the parallel characters’ pivotal whims, the movie wrestles with the desire to reject reality for one’s own desires. This theme echoes Edward’s conversation on this very subject with Mustang in the car near the end of the original series, and the brothers’ initial choice to seek to defy death in bringing their mother back to life. The soundtrack is nothing special, with echoes of themes from the original series mingled with a few unmemorable new ones. It is placed in such a way that it provides the right atmosphere, primarily using old themes in Amestris and new ones in Germany, but it’s nothing to write home about. One good choice was including gypsy music, which helped ease the introduction and inclusion of the character Noah. Overall, it did its job but not particularly well. In contrast to this is the brilliant sequence which highlights so many memorable scenes from the original series in an absolutely flawless opening accompanied by a romantic, nostalgic, and energetic song by L’Arc~en~Ciel. The sequences of computerized animation during some scenes with soldiers and aircraft were a bit jolting, especially in that they did not quite match with the movement of the characters in other scenes. However, the animation and art still holds for the most part to the original muted coloring and style of the series with some improvements in clarity and proportion. The Conqueror of Shamballa is not a perfect film and it misses opportunities because of its length and in its choices to focus on new characters more fully than some of the old ones. However, in movie format it feels more complete and whole than a series of episodes, which might have become disjointed, and even though it utilizes its length well, it never feels rushed, as it takes its time with slow scenes when necessary. It provides a more complete ending to the story and explores the climactic themes of the series in a fresh and more detailed way. I recommend it to any fan of Fullmetal Alchemist.